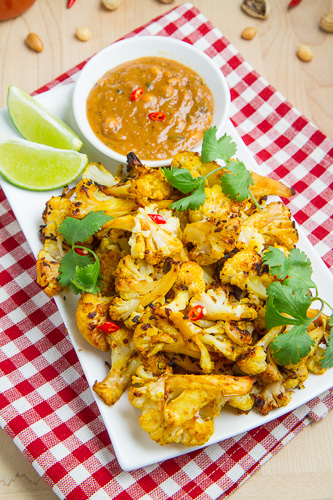 Cauliflower that is marinated in a satay style marinade and then roasted and served with a spicy peanut sauce. I have been a huge fan of roasted cauliflower ever since I first tried it! There is just something about roasted cauliflower… roasting it takes something that is pretty boring and transforms it into something that is extraordinary. Even in it’s simplest form, tossed in olive oil with salt and pepper, it is ridiculously addictive and I could easily chow down on a bowl of it rather than popcorn while watching a movie. The only real question is, why stop with salt and pepper when you could add any number of flavours or seasonings to the roasted cauliflower? Buffalo roasted cauliflower as to be one of my current favourites but I have plenty of ideas for roasted cauliflower starting with this chicken satay inspired one. 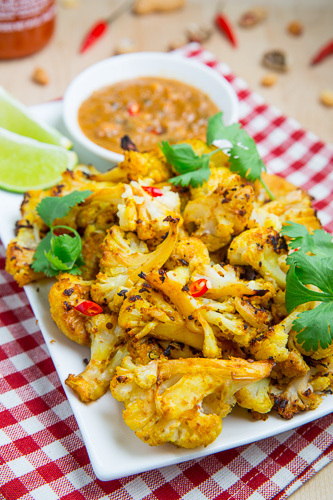 The basic idea behind this roasted cauliflower was to marinate the cauliflower in a satay style marinade, roast it and then serve it with a Thai style spicy peanut sauce for dipping. I was a little worried that marinating the cauliflower might cause problems with roasting but it works quite well with the cauliflower absorbing a lot of the marinades flavour and it still roasts up perfectly. This satay roasted cauliflower is super tasty all by itself but the peanut sauce takes it to a whole new level of amazingness! 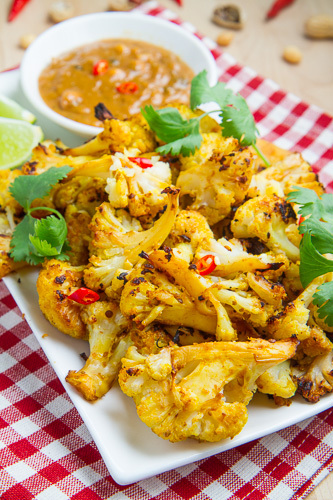 This satay roasted cauliflower is great as a snack, side dish or even as a light meal! Mix the coriander, cumin, turmeric, lemongrass, shallot, garlic, galangal, chili, lime, fish sauce sugar and oil and marinate the cauliflower in the mixture in the fridge for 30 minutes to over night. Arrange the cauliflower in a single layer on a baking sheet, and roast in a preheated 400F/200C oven until lightly golden brown, about 20-30 minutes, flipping in the middle. Spicy peanut sauce is just the best thing ever! This look so good! I love roasted cauliflower too. But I've only ever served it as a side dish. Making a dip and serving it as an appetizer is such a great idea. Wow! Can't wait to give it a try! I have been on a humongous cauliflower kick reently, but I never thought to pair it with peanut sauce (a.k.a. my ketchup — it goes with everything!). Thanks for the inspiration! Love this creative cauliflower recipe Kevin! We roast cauliflower all the time, so good for you and SO TASTY! I'm with Heather. This will make a delicious meal! Ohhh, I've never roasted cauliflower before – apparently I'm missing out!! i'm digging the flavors in this!! Oh, I'm in. After probably half a dozen quickly devoured pots of white cheddar cauliflower soup have passed through my kitchen I know you speak truth when it comes to roasted cauliflower. I am a huge cauliflower fan and this just looks divine. As luck would have it there is cauliflower sitting in my fridge right now – tomorrow it will transform into this! Thanks for the recipe. I love roasted cauli also and to see it paired with my favorite peanut sauce…drool is definitely spilling. Mmm so much goodness here. That sauce especially looks fabulous! I had creamy cauliflower soup today for lunch and have decided it may just be my favorite vegetable. so much to love about this dish! I'm a lover of satay sauce and I'm pretty sure I could nibble a broomstick if it was first dipped into a bowl of good peanutty sauce. Cauliflower and satay will make my mouth dance and much easier to eat than the broom. Roasted cauliflower has always been my favorite. We made this tonight and didn't even have peanut sauce to go with it. The best cauliflower any of us have EVER had!